How Much Wort Should Extract Brewers Boil? A full wort boil is best, but smaller worts can be boiled, especially for darker, less hoppy beers. Unlike all-grain brewers, extract brewers can boil almost any volume of wort they like — from volumes that are a fraction of the final batch volume to very large volumes. You can hypothetically dilute malt extract to almost any volume, boil it and still make beer. However, what is the best volume to boil for 5.0-gallon (19-L) batches? The best volume of wort to boil is that which can be boiled down to your batch volume in 60–90 minutes. For 5.0-gallon (19-L) batches, this is in the ballpark of 6 to 7 gallons (23 to 26 L) of wort. Performing a full wort boil has a variety of benefits. Two of the most important benefits include less wort darkening and better hop utilization. In addition, a 60–90 minute boil is enough time to fully form sufficient break material to result in a clearer beer. And finally, compared to boiling smaller volumes of wort, you’ll lose less sugars in the batch’s trub (the material that sediments in the boil) when you transfer the wort to your fermenter. In order to perform a full-wort boil, however, you need need a kettle large enough to hold your pre-boil volume plus about 20% (to allow for foaming), a heat source capable of bringing this volume to a vigorous, rolling boil in a reasonable amount of time and a method to cool the wort relatively quickly (in an hour or less) after the boil. For most homebrewers, the latter is accomplished by a wort chiller. Brewing with extract is meant to be a more convenient way of brewing at home (compared to all-grain), and most extract brewers brew on their stovetop and do not boil their full wort volume. How much of a detriment to beer quality is this? And, are there ways to compensate for boiling “thick” wort, then diluting the wort in the fermenter? Brewing an amber beer with malt extract is no problem. Lighter beers may be, depending on how much wort you boil (and how fresh your extract is). Wort darkening is a problem when boiling a thick wort, but you can see for yourself how much this is affecting your beer. When you brew, boil the amount of wort you usually do, but take two small, identical glasses (or jars or whatever) and sample your wort before the boil and at the end of the boil. Take small — less than 1 fluid ounce (~30 mL) — samples, just enough to able to judge the color. Alternately, if you add some of your extract late, take samples before the boil and before adding the late extract. If the samples show that your wort is picking up a lot of color during the boil, boiling more wort would benefit you. How much color pickup is too much is, of course, a judgement call. At a minimum, if the wort darkens to the point that you can’t hit a color target you want, that’s a problem. On the other hand, if you freqeuently brew dark beers, a little extra color pickup in the boil is less problematic. Hop utilization takes a hit when you boil a thicker wort and dilute it in your fermenter. This occurs for two reasons. The first is that hop utilization decreases with increasing wort gravity. The second reason is that extract worts are typically diluted after the boil. To determine if your boil volume is limiting your hop utilization to an unacceptable degree, you simply need to taste your beers — are they hoppy enough? If they aren’t, you can try adding more hops. But be aware that this also increases the amount of hop debris in your brewpot (which, for very hoppy beers, further lowers your wort yield). The dilution effect is easy to account for. If you wanted to brew, say, a 5.0 gallon (19 L) batch of beer with 35 IBUs and you boiled your wort such that you ended up with 2.5 gallons (9.5 L), you would need that wort to be 70 IBUs. 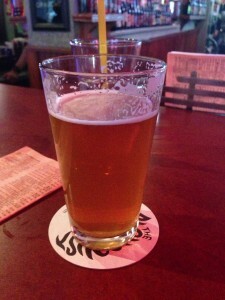 The general formula for this would be: beer IBUs = wort IBUs (post-boil wort volume/batch volume). So, boiling less than a full wort is not completely detrimental to beer quality unless it prevents you from reaching a color or bitterness target. If you were trying to brew a very pale double IPA, you would benefit from boiling as close to a full wort as possible. On the other hand, if you were brewing a dark amber Scotch ale, you could boil considerably less wort. In general, if you can boil more wort and maintain a rolling boil, plus cool that volume reasonably quickly, you should do so. As a general rule of thumb, I try not to end up with less than 3.0 gallons (11 L) of post-boil wort when making a 5.0-gallon (19-L) batch of extract beer. This is not a hard and fast rule, just a compromise between quality and convenience that works for me. If you are going to boil a thick wort, there are many ways that you can avoid or minimize the problems associated with it. Brewery grade malt extract has already ben boiled. It does not need to be boiled again. One very popular homebrewing method is to add some or all of the malt extract late in the boil. Brewery-grade malt extract — the stuff homebrew shops sell — has already been boiled. All you need to do is reconstitute it by adding water. By adding malt extract late in the boil, you limit color pickup and help hop utilization (by keeping the wort density lower through most of the boil). Many recipes call for witholding about half of the malt extract in a recipe and adding it with 15 minutes left in the boil. This works well when brewers boil 2.5 gallons (9.5 L) of wort or more. 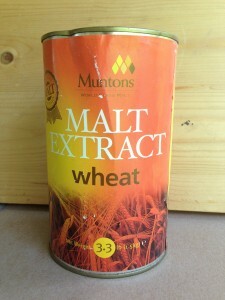 To get the most from this technique, add only enough malt extract to reach a wort density of around SG 1.020 early in the boil. (You may already reach or exceed this if you have steeped grains or supplemented your extract with a partial mash. If so, withold all of the malt extract.) Then, add the remaining malt extract at shut down. Hold the wort at 170 °F (77 °C) for 5 minutes before cooling. This should be (more than) enough to sanitize it. If your brewpot size or stovetop heat output limits the amount of wort you can keep boiling vigorously, you can keep your wort at that volume by topping up with boiling water. For example, if your stove could boil 3.0 gallons (11 L) of wort vigorously, but only simmer volumes greater than that, keep a small pot of boiling water next to your brewpot and keep the wort topped up by adding boiling water every 10 minutes or so. You can also assist your burner output by using one of those little immersion heaters that are usually used to boil small volumes of water for tea. For best results, bring your wort to a boil and let the foam subside before adding the immersion heater. Stovetop brewers can also split their wort into two or more pots, if this allows them to boil a greater volume of wort. Kettle additions of hops or other things (Irish moss) would need to be added proportionally to the multiple pots, but this could be eyeballed. The downside would having to cool the wort from multiple pots and clean them afterwards. It is also possible for an extract brewer to boil their wort in shifts. If you can boil to end up with 2.5 gallons (9.5 L) of wort, you can boil half of a 5.0-gallon (19-L) batch one day, and the remainder the second. The first half would already be fermenting by the second day. (Added bonus, you might not have to make a yeast starter to pitch to the first 2.5 gallons (9.5 L) of wort.) Just cool the second half and siphon it to the fermenter to yield 5.0 gallons (19 L). Do not aerate when adding the fresh wort to the already fermenting wort from the day before. Many commerical breweries have fermenters larger than their batch size and use multiple fills. The upside is that you can perform a full wort boil, split over two days. The downside is that you need two brewdays for every batch. Finally, if you are running into problems boiling thick worts for 5.0-gallon (19-L) batches of beer, scale your batch size down. Scaling down can allow you to perform a full-wort boil and likely pitch your yeast without making a starter. Of course, you do get less beer for your efforts. Extract brewers should boil as much wort as they can, provided they can maintain a rolling boil and be able to cool it within a reasonable amount of time. They can check for themselves whether their current boil volume is limiting them in terms of beer color or hop bitterness. 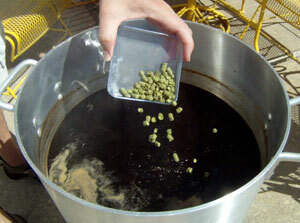 Some of the effects of boiling a smaller volume of wort can be mitigated by adding the malt extract late in the boil. If you’re boiling around 3.8–4 L (about a gallon), 4.5 L of pre-boil wort is not a bad amount to boil. About 10% per hour is how some brewers figure their evaporation rate in the boil. At such a small volume, however, your rate might be much higher. Start with enough volume (maybe up to 8 L/2 gallons) that you can boil vigorously for an hour and yield your target post-boil volume.